After getting over the shock of being traded, DeRozan has embraced his new role with the Spurs. From the outset of this very young NBA season, DeMar DeRozan has looked like he was always a San Antonio Spur. It only took him 2 1⁄2 minutes to score his first point for his new team in their season-opening win against the Minnesota Timberwolves, and he has led the Spurs in scoring in five of six games and assists in four. However, back on July 18, when he first heard he had been traded from the only team he had ever desired to play for in Toronto, he never would have imagined the transition would be so seamless. It took some reassurances from his former/new teammate Rudy Gay, his old coach Dwane Casey, and Gregg Popovich and R.C. Buford before he could truly start embracing the Spurs culture. Gay laughed when DeRozan called him in despair over the trade and offered words of encouragement because he knew it would all be fine. Casey told him he would love playing for Pop and to just represent himself to the best of his abilities. Finally, Pop and Buford assured him that he wasn’t coming to San Antonio because Spurs were desperate to find a taker for the disgruntled Kawhi Leonard; it was because they wanted DeRozan badly enough that they agreed to the deal. 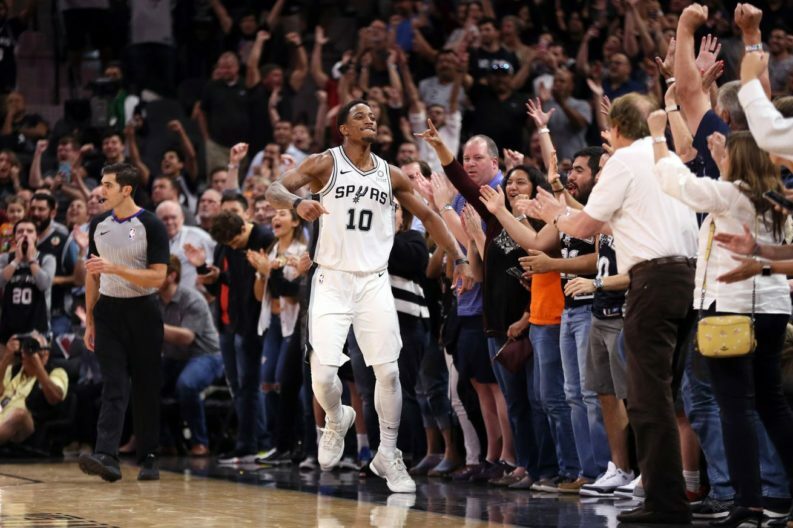 As the healing process began, including working out with Pop at Team USA’s mini-camp, DeRozan also began feeling the love emanating from Spurs fans, beginning with Nik Soupe’s mural of him at Rudy’s Seafood. And do something for the fans, he has — like winning games. As many have likely noticed, all four of the Spurs wins so far have come down to the clutch, and DeRozan has taken on the role of “closer” — something that the Spurs severely lacked last season — without missing a beat. He currently ranks second in the NBA in scoring in the clutch — which the NBA defines as the last five minutes of a game in which the score is separated by five points or less — with 21 points, 5 assists, six rebounds, and 0 turnovers. Although he missed what could have been the game-winner in regulation against the Mavericks, he was ready to not let the same opportunity slip in overtime, where he hit all three of his shots to help lead them to a relatively comfortable win (for OT, at least). Hopefully DeRozan won’t have to come through in the clutch for every Spurs win (a blowout and some rest for the starters would be nice, too), but for now the Spurs are certainly happy to have that go-to scorer that they were severely lacking during last season’s late game struggles. So far, DeRozan has been that and everything else they could have asked for.